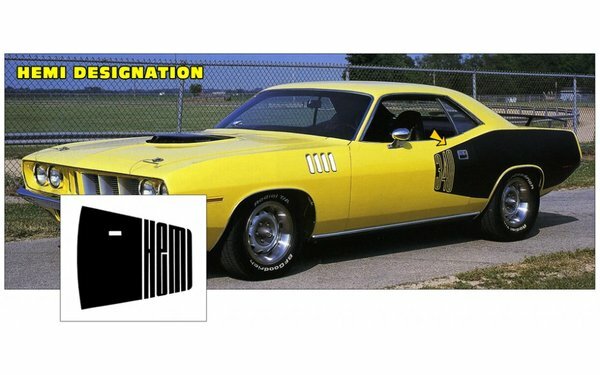 1971 Plymouth Barracuda Billboard Stripe Kit - HEMI Name - Billboard stripe kit applies from door to tail with HEMI name cut into stripe on doors, - kit both sides of car. NOTE: Any 1970-74 Barracuda stripe kit is interchangeable on any 1970-74 Barracuda. Any Mopar looks naked without the proper tape stripes. Here at Josh's Muscle Car Parts we pride ourselves on bringing to the market top quality, licensed by Mopar stripes and decals and at an affordable price. Our stripe kits include enough to complete one car and we only use the highest quality tape vinyl available - 3M. If you see a Mopar stripe kit offered a few dollars cheaper and you aren't getting 3M, then you aren't getting a quality tape stripe kit. All of our reproduction stripe kits come with a 6 year limited warranty against manufacturer's defects. When you buy from Josh's Muscle Car Parts, you buy with confidence.